If any of you are avid viewers of the Weather Channel, you know that we've been having epic rainfall here in Southern Cal. Floods, mudslides, tornadoes, mountain blizzards, we've had all that. 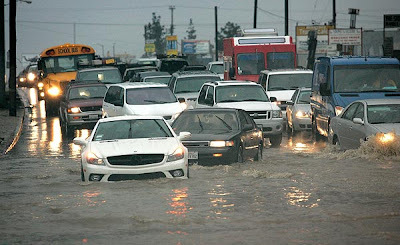 The worst thing about all this bad weather is that Angelenos just don't know how to drive in wet weather. Take this picture from the LA Times for instance. Dude, you are about to drive a $130,000 white Mercedes sports car into God knows how deep that flood is. What the hell are you thinking? I can only dream of owning a car like that someday and you are getting ready to submerge this exquisite piece of machinery into that swirling tempest of water and mud. Better to return to the DMV to get a refresher courses on driving in rainy weather.